Since March 9 of last year, Bloomberg News has published over 80 negative articles on the mega bank Wells Fargo. Some of the more recent headlines are: Wells Fargo CEO Abruptly Steps Down, Succumbing to Scandals; Wells Fargo’s CEO Disputes Claim His Bank Is Too Big to Manage; Elizabeth Warren on Wells Fargo CEO’s Departure: ‘About Damn Time’. Judging by the reporting, one would think that Wells Fargo is either the most dangerous U.S. mega bank or the most criminal. But according to Federal regulators, that distinction goes to JPMorgan Chase. 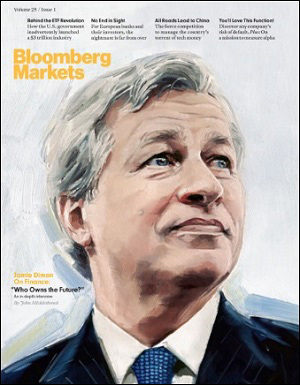 But oddly enough, Jamie Dimon, the Chairman and CEO of JPMorgan Chase, has been canonized by Bloomberg News for years, effectively endorsing him as the all-wise and customer-focused oracle of Wall Street. Wells Fargo has not been charged with a criminal felony count. Jamie Dimon, on the other hand, has presided, as CEO, over three criminal felony counts against JPMorgan Chase in just the past five years while, mysteriously, not losing his job and getting millions of dollars in raises and bonuses. JPMorgan Chase pleaded guilty to two felony counts in January 2014 for its role in facilitating the Bernie Madoff Ponzi scheme through the Madoff business bank account in the U.S., while telling regulators in the U.K. that the bank suspected a Ponzi scheme was occurring. Dimon still kept his job. On May 20, 2015, JPMorgan Chase pleaded guilty to another criminal felony count for the bank’s role in rigging foreign exchange markets. Dimon still kept his job. “In April 2012, Americans were confronted with a story of Wall Street excess and the derivatives disaster now known as the JPMorgan Chase whale trades. The largest U.S. banks today are deep into derivatives, complex financial instruments that derive their value from other assets. The derivatives behind the JPMorgan whale trades were part of a so-called ‘Synthetic Credit Portfolio’ that essentially made outsized bets on whether particular financial instruments or entities were creditworthy or would default during specified time periods. The bets were made by traders in the London office of U.S. banking giant, JPMorgan Chase. Their trades – meaning their bets — grew so large that they roiled the $27 trillion credit derivatives market, singlehandedly affected global prices, and finally attracted a media storm aimed at finding out who was behind them. That’s when the media unmasked JPMorgan’s Chief Investment Office (CIO) which, until then, had been known for making conservative investments with bank deposits. The four largest banks that control 90 percent of U.S. derivatives trading do not include Wells Fargo. They are JPMorgan Chase, Citigroup’s Citibank, Goldman Sachs and Bank of America. JPMorgan Chase has the largest derivatives positions of any U.S. bank, standing at $48 trillion as of December 31, 2018 according to the Federal regulator of national banks, the Office of the Comptroller of the Currency. Wells Fargo also did not become the subject of a book by two trial attorneys comparing the bank to the Gambino crime family nor has it paid as astonishing $36 billion in fines and restitution while the same CEO sat at the helm. That distinction also goes to JPMorgan Chase and its CEO Jamie Dimon. In 2015, the New York Post reported that Bloomberg Markets magazine was going to cease to exist as a monthly magazine but would relaunch in 2016 as a “promotional tool” for the company’s financial news/data terminals. According to the article, the decision “came directly from Michael Bloomberg,” who is the majority owner of Bloomberg News. Michael Bloomberg derives his billionaire wealth from the data terminals his company leases to the global trading floors of banks like JPMorgan Chase. It feels increasingly like Bloomberg News is functioning as Jamie Dimon’s P.R. agent rather than reporting the cold, hard facts of his tenure at the bank.